Truckee is a small town on the I-80 heading out to Reno. Every year, they get swamped with Burners heading to and from the festival. This year, their Public Art Commission are throwing an opening party for their summer exhibition of Burning Man photos. The party goes from 5-9pm on Friday June 8, wear costumes and help the locals understand just what this is all about. As the cars, vans, buses, and RVs stream through town draped with bicycles, sunshades, coolers, and more on their way to Burning Man each fall, do you ever wonder what it’s really like to be camped in the Black Rock Desert at the seven-day festival of art, community, and fire with people from all over the globe? Here’s your chance to experience a family-friendly version of the Burning Man experience without even leaving town. On Friday, June 8, the Truckee Public Art Commission will host a festive opening for their summer exhibition of photographs from past Burning Man Festivals at the Community Recreation Center off the Pioneer roundabout in Truckee. From 5 -9 p.m. experience a mini version of the famous event. Watch a parade of wild and crazy bicycles and art cars. Be amazed by fire dancers. Experience a continuous slide show of amazing Burning Man events, people, costumes, and artworks. Browse the hanging exhibit of Festival photographs in the halls. Dance to the DJ sounds of Gibran Rivas. Come in costume, bring the whole family, and experience the Burning Man magic without having to pack enough food and water for a week; load up protection from the heat, sun, and wind storms; or take time off work or school. 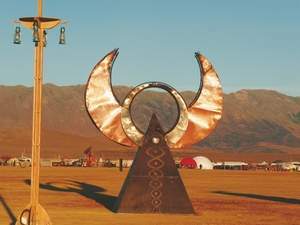 For more information, find Truckee Public Art Commission on Facebook or check out www.tdprd.com.